Junior running back Casey Filkins, who scored once and amassed 216 yards in total offense, credited his huge night to the Lakers' offensive line. "Incredible. They got an incredible push the whole first half," said Filkins, who rushed 32 times for 175 yards and one score. "We struggled a little bit coming out in the third quarter, but we picked it up in the fourth and we put together an incredible drive — that was big for us." "Playing West Linn is always a great challenge. It's always a fun time to play them," said Lake Oswego senior quarterback Jackson Laurent, who completed 16 of 23 passes for 245 yards and three touchdowns. "I think this one shows the whole state that we can play. One loss is not going to knock us down." With the win — Lake Oswego's second straight — the Lakers improved to 2-0 in Three Rivers League play and 5-1 overall, while the Lions fell to 1-1 in league and 4-2 overall. After the game, the Lions bemoaned their three turnovers and missed opportunities. "We just can't turn the ball over like we did turn tonight," said West Linn senior wide receiver Cade Knutson, who made three catches for 100 yards and two touchdowns. "We've got to capitalize. We had it in the red zone a couple of times and we just couldn't convert on that." "I think there were just too many turnovers, too many mistakes as a team," added West Linn senior running back Dawson Jolley, who carried 12 times for 95 yards. "I think if we eliminate those turnovers, we would have had a good chance in this game." The Lions started Friday's game in top gear, taking the game's opening kickoff and driving 78 yards to score in just four plays, the clincher an Ethan Long completion to Knutson in the left flat that Knutson turned into a 63-yard score just 1 minute, 37 seconds into the game. The Lakers answered with a 78-yard touchdown drive of their own, closing within 7-6 when Laurent hit junior tight end Marshall McGuire over the middle for a 13-yard score. Along the way, Filkins ran six times for 40 yards while Laurent went 3 for 3 passing for 35 yards. "West Linn has been a big rival for us the last couple years so it's always good to come out and play hard against those guys," said McGuire, who caught four passes for 59 yards and two scores. "We wanted to make sure we could establish the running game, pound it and just come out strong." Lake Oswego junior Joe Hutson put the brakes on the Lions' next series when he picked off an Ethan Long pass and — after a Laker penalty — gave his team possession at the West Linn 27. On third down, Laurent connected with McGuire for 19 yards to the 8, and on the next play, Filkins went up the middle, cut left and scored to give his team a 13-7 lead with 2:34 to go in the first quarter. 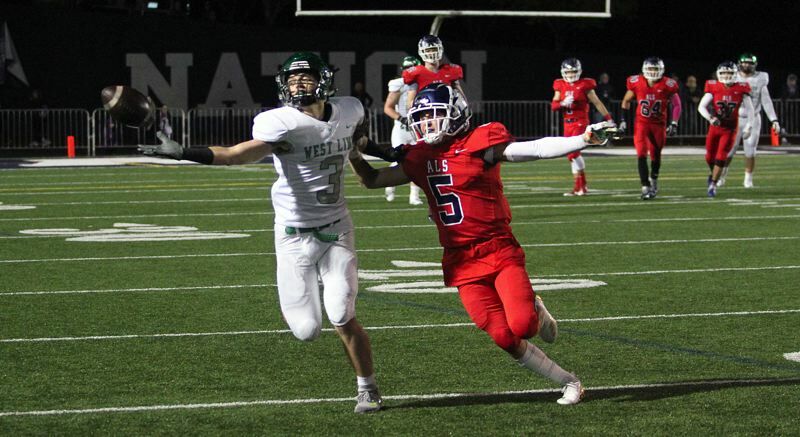 After the Laker "D" forced a three-and-out — highlighted by senior linebacker Gabe DeVille's tackle for a loss — the Lake Oswego offense found the end zone again just five plays later. Laurent hit Jack O'Brien for 10 yards, Filkins ran twice for 10 more, and Laurent then connected with junior wide receiver Thomas Dukart for a 38-yard score at the left flag on the first play of the second quarter to push their team's lead to 20-7. Nineteen seconds later, the Lions turned the ball over on a fumble and the Lakers took off on a 77-yard scoring march. That drive was highlighted by Filkins' 37-yard burst up the middle, a 26-yard Laurent throw to Dukart and Laurent's 26-yard throw to McGuire at the right post that extended the Laker lead to 27-7 with 9:40 left in the half. The Lions came back behind a big play of their own, getting a 72-yard run by Jolley — a dive that he broke to the right sideline and took to the Laker 1 — and a Long TD run that brought West Linn within 27-14 with 8:24 to go in the half. The Lakers didn't blink, however, and answered with a 70-yard drive that boosted their lead to 34-14 when senior running back Keenan DeRaeve smashed into the end zone from 4 yards out with 2:07 remaining before the break. Leading up to DeRaeve's score, Filkins ran six times for 26 yards and caught one pass for another 16 yards. "The line was really phenomenal tonight. I give props to them for pushing me through to the touchdowns," DeRaeve said. "I didn't really do anything, I just got the ball and they did all the hard work, basically." Perhaps the Lions' most important possession of the night followed next, with West Linn driving 63 yards in just eight plays — Long completed 6 of 8 throws for 56 yards along the way — and earning a first down at the Laker 4-yard line. But it all went wrong for West Linn from there, with Long throwing four straight incomplete passes — the third defended by LO senior Matt Sebolsky and the last of those an overthrow of Casey Tawa on fourth down — and the Lions coming up empty with three seconds left in the half. "That was a huge stop by our defense at the end of the half," Filkins said. "That was, honestly, the game. That was the play of the game." "If we came out like we did in the second half, we'd have a really good chance to beat anybody," Knutson said. "We just can't come out flat like we did in the first half." To their great credit, the Lions stepped up with a quick second-half stop that set the table for a 65-yard West Linn scoring march that ended when Long hit Knutson on the right seam for a 24-yard TD that brought their team within 34-21 midway through the third quarter. The Lions forced another stop after that and drove 50 yards to the Laker 12 on the ensuing series, but they snapped the ball high over Long's head on a second-down play and McGuire recovered at the 31. After a trade of punts took the game into the fourth quarter, Lake Oswego iced its victory with a 19-play drive — the last 13 of them runs — that covered 86 yards, took 10:02 off the clock and ended on DeRaeve's 1-yard dive with just 1:41 left on the clock. West Linn got the day's final score when Long hit Tawa for an acrobatic 23-yard catch at the right flag with seven seconds left in the game, but it was too little and too late. "The line really stepped up tonight, did a great job," Laurent said. "You saw the last touchdown drive, 10 minutes and three seconds on 19 plays. You can't say enough about them. It was their game today." "Like our coach said, we just need more dogs on the field," Jolley added. "I felt like (Lake Oswego) had more dogs on the field. They had physical guys coming at us and we didn't do a good job with our tackling." For the game, Dukart made eight catches for 135 yards and one score for LO. For West Linn, Long went 20 of 37 for 265 yards, three TDs and one interception, Jake Mastrandrea made three catches for 64 yards, and Tawa had five grabs for 40 yards. Next up, West Linn hosts Tualatin at 7 p.m. Friday while Lake Oswego plays at Canby at 7 p.m. Friday.